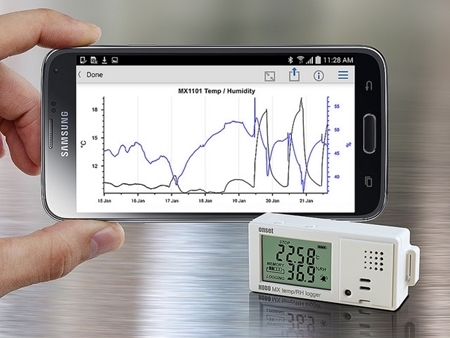 Important: The HOBO MX100 data logger requires the HOBOmobile App and a compatible mobile device. The system requirements for the HOBOmobile app can be found at the bottom of our HOBOmobile software page. 1 year, typical with logging interval of 1 minute and Power Saving Mode disabled; 2 years, typical with logging interval of 1 minute and Power Saving Mode enabled. Faster logging intervals, remaining connected with the app, excessive downloads, and paging may impact battery life. Learn about Onset’s HOBO MX100 low-cost, splash-proof data logger that measures and transmits temperature data wirelessly to mobile devices via Bluetooth Low Energy (BLE) technology.